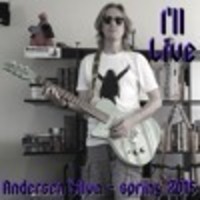 Singer/songwriter Andersen Silva's double album "I'll Live" contains 42 originals (two co-written with others) ranging from pop-punk to electronic to rock to... well, whatever came to mind. Let Talking Heads, David Bowie, Trent Reznor, the Cars, Roger Waters, and half a Ramone take turns writing and playing songs together, and you might get something like Andersen Silva. Or you might not.